The oil industry gets a lot of attention, but for my money the most powerful lobby in U.S. politics is agriculture. Between commodity crops and meat, the sector is huge. Plus, the very makeup of the U.S. political system, with lightly populated rural states getting disproportionate power in the Senate, ensures that agricultural interests will almost always get a friendly hearing in Congress, no matter which party is in power. And farming has always had a special place in the American psyche, even though fewer than 2% of Americans farm for a living these days. Let's put it this way: it's practically a patriotic duty to hate Big Oil, no matter your political persuasion. Big Ag, I suspect, is much less unpopular, even after muckraking works like Fast Food Nation and Food Inc.
That's what made what happened in a federal courtroom in New York last week so amazing. Ruling on a lawsuit brought by a team of environmental groups including the Natural Resources Defense Council (NRDC), Judge Theodore H. Katz ordered the Obama Administration to tell pharmaceutical companies that the government might be moving to ban some popular antibiotics for use in meat production. Environmentalists and public health experts have argued for years that the overuse of antibiotics in domestic animals can lead to a rise in drug-resistant bacteria, sapping the power of those life-saving drugs in people. But the Food and Drug Administration (FDA) had long dragged its feet on regulating the use of those drugs in agriculture, even though government scientists determined 35 years ago that they posed a threat to public health. Katz's ruling  which comes two months after the Obama Administration announced restrictions on agricultural uses of certain specialized classes of antibiotics  could set the stage for changes in Big Ag. "This victory will help protect American families against superbugs and other drug-resistant bacteria," wrote Peter Lehner, the executive director of the NRDC, in a blog post after the ruling. According to an FDA study, some 80% of the antibiotics sold in the U.S. are used in farm animals. Some of those are used to treat sick animals, just as they would be used on sick people. But a large chunk of those antibiotics are given through feed or water, often without the direct supervision of a veterinarian, for growth promotion or to simply help pigs or cattle survive the close quarters and difficult conditions of a factory farm. More drug use means more antibiotic-resistant bacteria, as microbes learn to adapt to penicillin or tetracycline. That's become a major public health problem: some 100,000 Americans die each year from hospital-acquired infections that are resistant to most antibiotics. 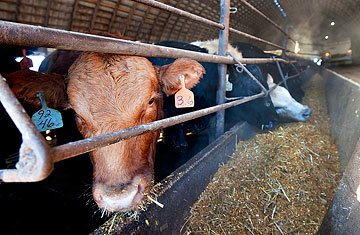 The more antibiotics are used on the farm, the less effective they may be for those who really need them. Indeed, by 1977 the FDA had concluded that antibiotics were being overused in some forms of meat production, and announced that it would begin banning some agricultural uses. But the meat industry has long opposed regulations on antibiotics, arguing that farmers use the drugs judiciously to control disease in animals, and that resistant bacteria is due more to the overuse of antibiotics in the hospital than on the farm. So it shouldn't be surprising that the Senate and House appropriations committees passed resolutions against any FDA bans at the time, and the agency stepped back rather than take on the agriculture industry directly. Environmental and public health groups petitioned the FDA to revisit the move to ban drugs used in promoting animal growth. The NRDC and its allies argued in the lawsuit filed last year that the evidence supporting the FDA's original position  that antibiotic use for growth promotion presented a clear public health risk  had strengthened. And Justice Katz ultimately agreed, writing in his order: "The scientific evidence of the risks to human health from the widespread use of antibiotics in livestock has grown, and there is no evidence the FDA has changed its position that such uses are not shown to be safe." It's not clear how big an effect the ruling will ultimately have on antibiotic use. The FDA has refused to put forward restrictions on drugs used specifically to prevent disease even if the antibiotics are delivered via food or water, and the ruling doesn't address this either. Farmers may simply say that the drugs are being used to treat or prevent disease, and still go on using them. For its part the Animal Health Institute (AHI), a meat industry trade group, argued that the ruling would distract from an effort to collaborate with the FDA to stop growth promotion drug use. "It is unfortunate that time and resources will now be diverted to responding to the court decision," the AHI said in a statement. Still, even if Katz's ruling is limited, it's one more indication that Big Ag isn't as all-powerful as it once was  and that change could be coming to American meat production. That's good news for the health system, and for anyone who likes their burger drug-free.